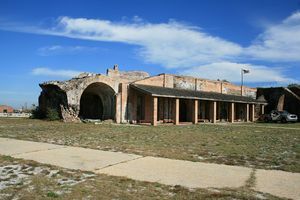 Fort Pickens (1829-1947) - A Third System brick fort with seven Endicott Period batteries and three World War II batteries installed in and around the fort. Fort Pickens is located on Santa Rosa Island, Escambia County, Florida. Construction of the original brick fort began in 1829 and was completed in 1834. Originally designed by Simon Bernard and Joseph G. Totten. Named after Gen. Andrew Pickens. Decommissioned in 1947. Part of the Harbor Defense of Pensacola. Constructed to provide protection for the entrance to Pensacola Harbor along with Fort Barrancas, Fort McRee and the Advanced Redoubt. Fort Pickens was the largest of the fortifications guarding Pensacola Harbor and was designed as the Headquarters for Gulf Coast defenses. The original design by Joseph G. Totten was modified by his superior Simon Bernard so that the two seacoast fronts reflect the Totten design while the other three sides reflect the simpler Bernard design. As built, the fort had two, 1000' long seacoast fronts with dual gun casemates and a barbette tier on top. The two secondary fronts were shorter with casemates that served as gun rooms and crew quarters. A backfilled wall and gorge with massive bastions protected the landward side from an attack down the island. The seacoast fronts had modified demibastions at each end and a small tower bastion at the center. Armament was to have been 252 guns of different types and caliber. The Peacetime garrison was designed for 100 troops with a wartime capacity of 1,260 troops. Construction was supervised by Col. William H. Chase. After the Mexican War Fort McRee, Fort Barrancas and Fort Pickens were garrisoned only during drills, maneuvers and target practice from the barracks at Fort Barrancas, this continued up to the start of the U.S. Civil War. 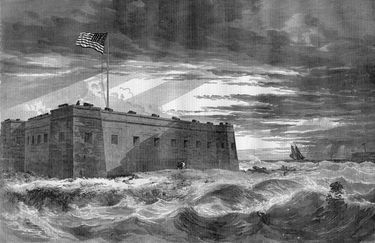 Florida left the Union 10 Jan 1861 and secessionists seized Fort Barrancas, Fort McRee and the Advanced Redoubt, only Fort Pickens remained in Union hands and it effectively blocked Confederate use of Pensacola Harbor. The 6th New York Volunteer Infantry landed on Santa Rosa Island 26 Jun 1861 from the side-wheel steamship Vanderbilt and encamped at Camp Brown, about one mile east of Fort Pickens. Camp brown was attacked on the night of 9 Oct 1861 by Confederate forces who destroyed most of the camp before being driven off with help from Fort Pickens reinforcements. On 22-23 Nov 1861 and 1 Jan 1862 Fort Pickens and its exterior batteries came under bombardment from Confederate-held forts and batteries. By May 1862 Confederate forces had abandoned attempts to take Fort Pickens, withdrawn from the Pensacola area and all of the Pensacola Harbor defenses had been returned to Union control. 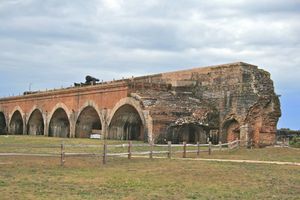 Fort Pickens was not attacked again during the remainder of the war and served as a prison for military and political prisoners. The fort is listed as having at most 146 Confederate prisoners at any one time during the Civil War period and of these, there were 11 escapes and 2 deaths. After the war, Apache Indian chief Geronimo and 50 Chiricahua Apache men, women and children were imprisoned in Fort Pickens from Oct 1886 to May 1888. Construction of seven Endicott Period gun batteries began in 1896 with Battery Cullum and continued through 1906 with the last batteries accepted for service in 1908. Two disasters slowed things down and caused some major rework of structures already completed and accepted. 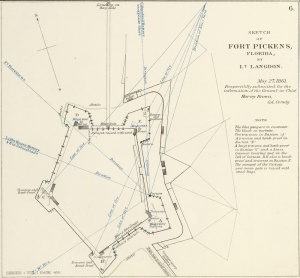 Early in the morning of 20 Jun 1899, a fire broke out in the second or third casemated west of the sally port in the old Fort Pickens. A detachment of troops turned out to fight the fire but heat from the fire and a lack of equipment prevented them from controlling the blaze. As the blaze advanced toward the northwest bastion magazine the detachment was forced to withdraw to escape the anticipated explosion of the magazine. The fire reached the magazine at 5:20 am and 8,000 pounds of powder blew up in an explosion that was heard for miles. The explosion brought additional help and the fire was extinguished. One man had been killed and another seriously injured by falling debris. The blast had destroyed the northwest bastion and a line of mining structures along the northwest side. The damage to that side of the old fort can still be seen today and a large gap is all that is left of the northwest bastion. Battery Pensacola, which is built into the parade of the old fort, received only minor damage. On 26 Sep 1906, the eye of a killer hurricane struck the Pensacola area causing ten feet of water above the normal high tide to wash over the Fort Pickens cantonment area. The detachment on the island fled their frame dwellings for the safety of the old brick fort and lashed themselves together as they crossed over to the old fort. Fort McRee suffered an even higher surge of twelve feet and several military and dependents were swept away. The immediate damage was estimated at $ 87,000 but that did not take into account the seawalls that would eventually be required. The seawalls at Fort Pickens and Fort McRee were later estimated to cost $ 907,100. Major repairs were required on some of the Endicott Period gun batteries. 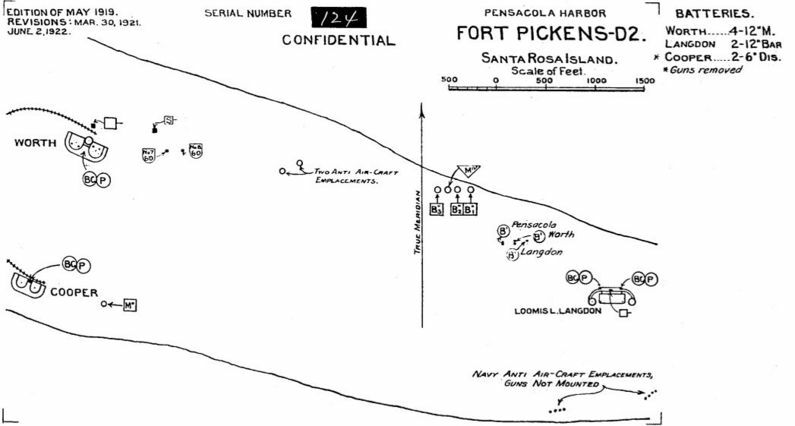 The cantonment area of Fort Pickens was built out during the Endicott Period in two separate areas. The first was the engineering area built at the landing of the engineering wharf and the second was the Coast Artillery area built at the base of the quartermaster wharf, both on the north side of the island. The Coast Artillery compound was built out as a small, one company, coastal post with a single 109 man barracks, limited officer and NCO housing and only the basic support buildings. The post was close enough by boat to Fort Barrancas that personnel could travel there for additional support. The 1906 hurricane caused damage to the post buildings as well as the gun batteries and the decision to build a seawall included protecting both the engineering area and the Coast Artillery area as well as the six gun batteries on the tip of the island. The seawall was completed in 1910 and soon after that additional quarters were added. Construction began in 1917 on Battery Langdon, which would be armed with two 12" long range guns. This battery differed from the earlier Endicott Period batteries because the guns were emplaced on open circular pads in M1917 Barbette carriages that allowed the guns to be elevated up to 35 degrees. The increased elevation maximized the range of Battery Langdon at about 16 miles. Battery Cooper was disarmed during the war and Battery Van Swearingen was deactivated in 1921. Battery Pensacola, Battery Cullum and Battery Sevier were all deactivated in 1933 leaving only three of the original Endicott Period batteries active as World War II approached. Additional temporary World War I type barracks and mess halls were added during the war to accommodate increased readiness. Most of the temporary buildings were removed during the 1920s and 1930s. Some of the temporary structures can still be seen on the 1922 plan above. 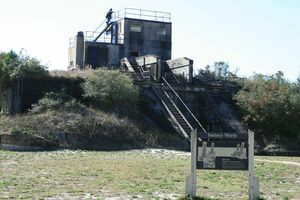 A coast defenses modernization plan was approved in 1940 that would bring to Fort Pickens two new rapid-fire gun batteries and casemate Battery Langdon to protect it from aircraft and plunging naval fire. The 12" mortar Battery Worth (2) was also obsolete at the beginning of the war and it was scrapped late in 1942. The magazines and bombproofs of Battery Worth (2) were converted into a combined Harbor Entrance Control Post and Harbor Defense Command Post (HECP/HDCP) for Pensacola Harbor. Construction began in 1943 on the two new rapid-fire gun batteries for Fort Pickens. Battery AMTB - Fort Pickens was completed that same year, it was a lightly armored, 90mm battery, designed to defend against high-speed motor torpedo boats and aircraft. Battery 234 was a more heavily armored 6" gun battery designed to take on larger boats at greater distances. Battery 234 was completed in 1943 but not armed before the war ended. 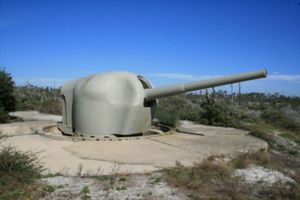 Battery Langdon provided the long-range defense of Pensacola Harbor and, to protect it from aircraft and plunging naval fire, it was encased in a concrete bunker (casemated) between 1943-1943. Only two of the original 3" Endicott Period batteries, Battery Payne and Battery Trueman remained active through the end of the war. The World War II buildup of the post was even larger than it had been for World War I and was complicated by the demolition of the only barracks in 1940. An inventory of post buildings in 1943 indicates there were 38 permanent buildings and 90 temporary buildings on the post. Thirty or so of the temporary buildings were barracks, indicating that the post capacity was about 2000 enlisted men, not counting hutments and tents. The Harbor Defenses of Pensacola were declared surplus to the Nation's needs on 5 May 1947 and they were ordered deactivated. Most of the remaining armament on Fort Pickens was demilitarized and salvaged over the following summer. Fort Pickens was a Florida State Park until the creation of the Gulf Islands National Seashore in 1971, the fort was reopened to the public in 1976. The Gulf Islands National Seashore is administered by the National Park Service. Fort Pickens was covered by a 30' storm surge from Hurricane Katrina on 29 Aug 2005 and public access was very difficult until the damage was repaired and the road was restored in 2009. Several display guns from the U.S. Civil War era are on display in the old fort including a 15" Rodman cannon on the parapet, a converted 10" Rodman with an 8" rifled sleeve and a large mortar. One 6" Endicott Period disappearing gun is on display in Battery Cooper. Two World War II era 6" rapid fire guns can also be seen at Battery 234 in their Shielded Barbette Carriages (SBC). These guns and mounts were transferred from Fort John Custis, Battery 227 in 1976, and they are one of only two sets of these guns and mounts in the U.S. Location: Western tip of Santa Rosa Island, Escambia County, Florida. Roberts, Robert B., Encyclopedia of Historic Forts: The Military, Pioneer, and Trading Posts of the United States, Macmillan, New York, 1988, 10th printing, ISBN 0-02-926880-X, page 195-198. Weaver, John R. II, A Legacy in Brick and Stone: America Coastal Defense Forts of the Third System, Redoubt Press, McLean, 2001, First Printing, ISBN 1-57510-069-X, page 159-163. This page was last modified 17:28, 16 April 2019 by John Stanton. Based on work by Bill Thayer.